I’m really excited about my two upcoming online workshops and the main reason is because it’s the only time I’m teaching online this year! I’d so hate for you to miss the fun. I love doing online classes buy my schedule is just too full right now to more than this. Now, I know it’s durning the summer (all summer long if you take both sessions) but the awesome thing about these classes is that you have the option to purchase a DVD of all of the video lessons from inside the workshop! So if you don’t have time to do all of the workshop this summer you can pop in, say hi and download the written materials, purchase a DVD and do the class later at your own pace, no worries! Almost every person opted for the DVD last year, most just to have on hand to revisit the material later. And seriously, I guarantee you that as soon as registration closes there will be people wanting in-it happens every year! So don’t get busy and forget to sign up today! Artful Gathering strives very hard to bring an Art Retreat atmosphere to the whole event. There will be book signings, giveaways, raffles, door prizes and more! Optional DVD that can only be purchased in the class! Workshop Handouts that you can download and print out! My Sponsor Giveaway (includes a signed copy of my new book hot off the press in September! I will also draw two names to each receive a FREE DVD if they purchase one of my classes. So what do you have to do to enter? Leave a comment including your FIRST and LAST NAME and or contact info ( so I can tell you that you’ve won!) and I’m going to ask that you tweet, facebook or blog about this giveaway. Now I’m not going to be checking to see that you did, I’m just asking that you help me share the news about Artful Gathering and my workshop giveaway. Just a quick link share would be awesome! Wow! I’d love to win a “ticket” to the summer workshop, DVD or whatever. No false flattery, but every class/book from you means artistic growth for me. Hopin’ I win the prize! How generous! I would love to win this. I watched your paper clothe scissors video and thoroughly enjoyed it. You have a great teaching style. Thanks. I was so excited to find out about giveaway!!! Have been dying to take your class and waited patiently for nearly a year!! Hey girlfriend, have I told you lately how happy I am for you & your wonderful successes! You’re rockin’ it! Pam…your work is so inspiring. Thank you for the chance to take one of your AG online classes! I’m off to share on FB…good luck everyone! Art Class + Pam Carriker = A very happy, eager and inspired Maggie. I gotta win it’s my destiny! Oh MY! I’d love to win one of the classes! The trouble is choosing which one! Congratulations Sarah!!! You have won a free DVD with the purchase of one of my workshops! The DVD’s are available only through the workshops so let me know if you end up taking one and I will send you the DVD of that class for free! your classes both look wonderful and so generous of you to give these things away! Please include me in the draw…. i will share this with others! Hi Pam, I’d love a chance to win a spot in your A Cut Above class. I took your Still Pursuing Portraits last summer at AG and loved every minute of it. Your drawing is amazing and I’d love to take a class from you! thank you pam. i love watching how your art is evolving! I enjoy your work and would like to win! Wonderful looking workshop! Thanks for a chance at it. I really love your work and I think that the new 4 x 4 stencils are a great idea. I would love to have the opportunity to win a place in you online class! Thanks so much. Thanks for the wonderful chance to win one of your amazing classes. Congratulations Debbie!!! You have won a free DVD with the purchase of one of my workshops! The DVD’s are available only through the workshops so let me know if you end up taking one and I will send you the DVD of that class for free! Hi Pam, Would love to win one of your classes. You tutorials, book and blogs are great. 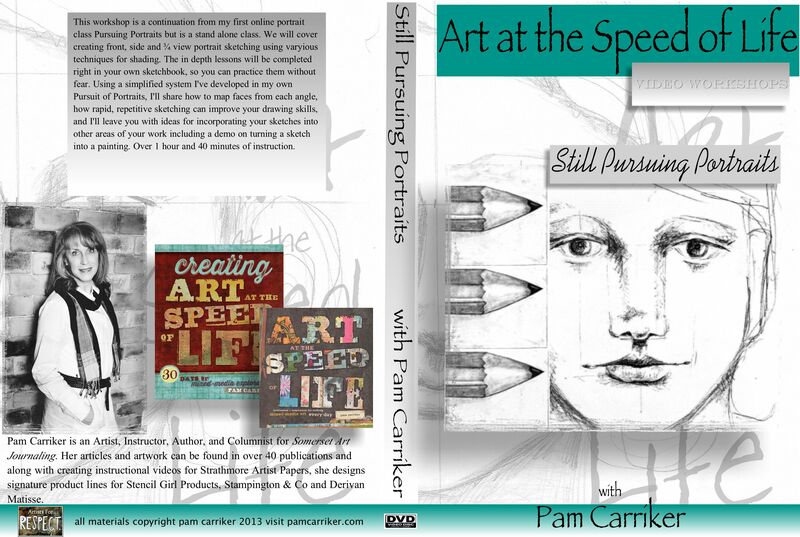 Pam, I took an on-line class from you a few years ago at Creative Workshops. You are an awesome teacher! I would love to win a spot in a class as finances are really tight right now. I have been wanting to take one of your workshops, it would be fabulous to WIN one! What a great giveaway. Love your portrait work!! Yes please, I’d like a chance to expand my artistic horizons by winning! Love your art work and can’t wait to read your book. Love the idea of small stencils for journaling. Love the idea of winning a free workshop too! Congratulations Mary!!! You have won your choice of one of my workshops at Artful Gathering!!! Email me at pamcarriker@gmail.com and I will get you all set up and registered! Hi Pam, I love your art! Thank you for the chance to win a workshop or DVD. It’s been over 12 months since I took a class with you… time for another I think!! Thanks for an opportunity to win a spot in one of your online classes! Pam…will they be selling your products online only?..or in their stores as well? I have a store near me so I am very excited! I admire your work. Would be awesome if I won. Hi Pam! I would love to win your class. Thanks for the chance. Thank you so much for all of the inspiration. You are a truly talented lady. I would love to win a chance to take one of your online classes! I can’t wait to see your new stamps..your stencils are fantastic! I’d love to win a spot in one of your workshops. I took your Strathmore class and it changed my art journaling significantly (and for the better : ). I will repost about your give-away. God bless. I’m so excited you are doing an online class – I’ve got your DVD’s, book and pre-ordered your new book – love your work! Congratulations Patty!!! You have won your choice of one of my workshops at Artful Gathering!!! Email me at pamcarriker@gmail.com and I will get you all set up and registered! Hi, Pam! I’d love the chance to take another class with you. I’ve enjoyed (and employed) what I’ve already learned from you. Here’s hoping!!! Hi Pam. This is so generous of you to offer. I would love the opportunity to enjoy one of these classes. Learning from someone with your talent is awesome. Thank you. You are such a talent! Would love to win….pick me.. pick me. Would love to be a bit lucky, and win a spot with you and your wonderful class! Hi, of course would love to win a spot. I don’t have anything witty or inspiring to state. Simply would just like to be a bit lucky. Would love to take one of your workshops, to win one would really be great!!! Thanks for this opportunity!! Enjoyed your latest in Somerset – would love to participate in one of your classes. Sharing on FB. Hi Pam I would love an opportunity to step out of my comfort zone and try something new so this is a great chance. Thankyou for offering it I will share this opportunity with others on fb to show the many different things that can be learned through artful gathering. Thank you for the awesome opportunity! I just shared it on facebook, but I hope I’m the one who wins! Pam, I would love to win! I’m putting a link on my facebook account now. I have your first book and anxiously awaiting your second. Your teaching style just connects with me and I’m learning a different dimension to my art because if you. 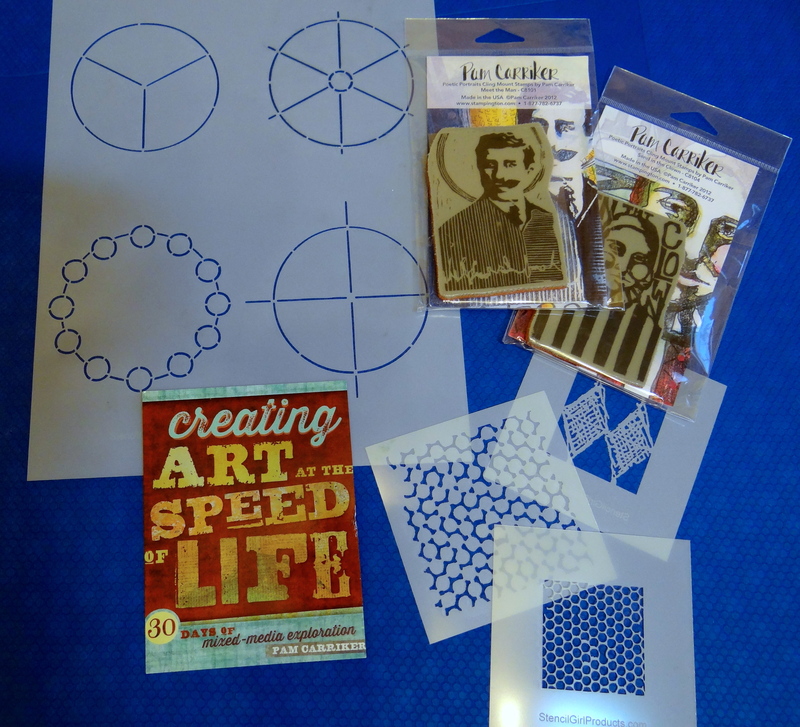 I have purchased your products and stencils and love them! The liquid lead is over the moon!!! P.S. Blogged here: http://www.scrapscene.com/2013/05/contests-calls-events-92.html & Tweeted & FB’d too. well, this would be the BEST way to spend a summer! thanks for your generous offer…..
Would love to be able to take one of your courses! Thanks for all you do. Thanks so much for the chance to win one of these great classes! They both look fantastic! I just got Somerset Studio and saw a big article on you there as well as Art Journaling! Congratulations! Hi Pam, thanks for this great opportunity to take another one of your classes. I am the winner in the blog hop, also I do not participate to win a workshop, especially that I joined for “Still pursuing portaits”. I’m so happy, and I can’t wait! I share this on FB and my blog. What a wonderful opportunity! Love your classes, would love to win one. This is a fantastic giveaway! Would love to take this course from you. Thanks for this opportunity. I have SOOO wanted to take one of your classes, have been looking at the portrait one on dvd may be I will be the lucky one!! I have already taken a class with you and I’d love to win of course. I am also waiting for your second book (reserved via Amazon). Thanks ! Yay! Super excited about both! Please count me in, I would love to do one of your classes! So excited. Thank you for the opportunity to win. I love your work and would love the chance to learn from you. Thank you for the chance. I would love to learn from you! Your artwork is inspiring, thanks for the chance to win! Wow, it would be awesome to win one of your classes! I have your first book and one of your DVDs. Yes, I’m a fan. Hi Pam, what a great giveaway, i would be ecstatic to win any one of your classes.I watch you on YouTube all the time and have added you to my favorite channel, and i have also put a link to your site on my Blog, thanks Gail . I took your portrait class and it was fabulous. I would so love to do another, as I still have work to do on my skills. I also have a few of your DVD’s and they are really great. Can’t wait for the ne book too! WOW I’d love to win one of your classes. Glad to share! Have your books & CD would love a class! Hi Pam, thanks for such a great opportunity. Love your art and you inspire me! My name is Ronda Conley. Peace & love! What a great giveaway! I’ve thoroughly enjoyed your classes and would love to participate in another! I posted on my Facebook and am interested in your class! Shared! I’d love to take Still Pursuing Portraits. An Artful desperate, I will happily and speedily spread the word on all my social media. Who would have thought even 30 years ago that we would have such opportunities to learn and grow. Thankyou internet and thankyou Pam…. This is so exciting I would like to do STill pursuing potraits. cool~i’ll pass the info on also! Pam, I was one of the ones who did not take your class because I forgot! Thanks for the second chance at these great classes! I, twitted and shared on FB! 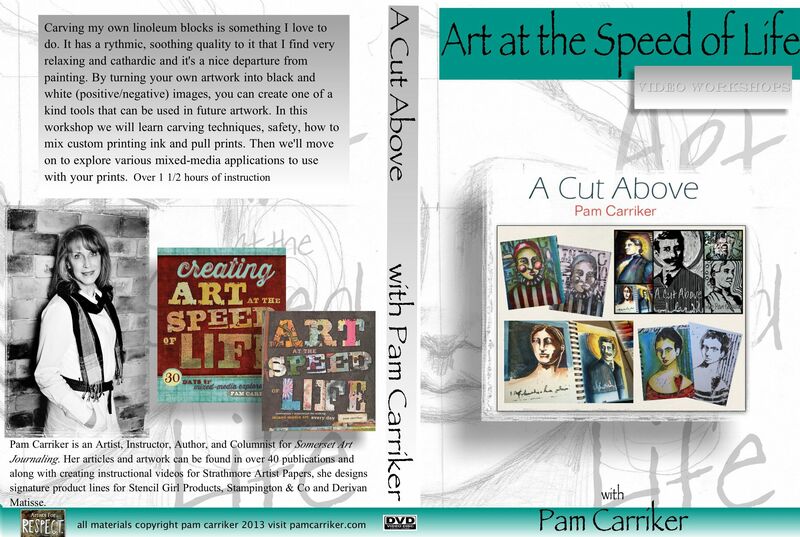 Looking forward to your Cut Above at Artful Gathering! I am already signed up. well since i barely remember how to do the lino cutting and i really liked it, i’m gonna enter! Thanks for the opportunity Pam!! I’ll share on my fb and keep my fingers and toes crossed!! I would love this so much! Carlanda williamson. will share on Facebook. Thanks pam. I would love to have a class,from you. Since I live in Hawaii. Our only chance to take any class is the internet. Pam, I would love to have a little extra motivation like an online class. I’ve been following your work for a while now and like your style. Oh I hope I win the Cut Above class! I so love your method of teaching online and by CD. Thanks for the chance to win! Judy in Northern Alberta Canada! Took your Strathmore workshop and have your book Art of the Speed of Life, and have your CPS cd. Would love to win your workshop! Would LOVE to win a class, so excited! Thanks a lot Pam. Wow! How exciting. I would love to take one of your classes. Thanks for the opportunity! I have your DVD and would love to expand my knowledge of your techniques! I would love to win one of your classes. Thanks for the opportunity! so exciting! I purchased your Pursuing Portraits DVD (awesome! )and would love to take your class a Cut Above! Hey Pam, loving my cc of Art at the Speed of Life, and the very thought of learning how to portraits gives me sweet butterflies. ty. I would love to win any of your classes! I’ll post about it on my FB status! I’d love to do your “a cut above” class!! What a great offer. I would be thrilled to win any of the 4 options. thank you for the giveaway Pam – it is very generous of you! I would love to win anyone of your classes! Hello Pam, I discovered your work while on Youtube last week, then happened to be in my favorite book store that same day and there your name was on the cover of a Somerset Studio magazine…fate! Of course I bought it and I just received your first book, which I love! Thank you for the chance to win a class! What a great opportunity to win one of your classes – I did two last year, they are very inspiring – thanks very much! wow – what a nice option, Pam – thanks so much! I really want to win the give away!!! I’m starting to use stencils more – so more is always better! 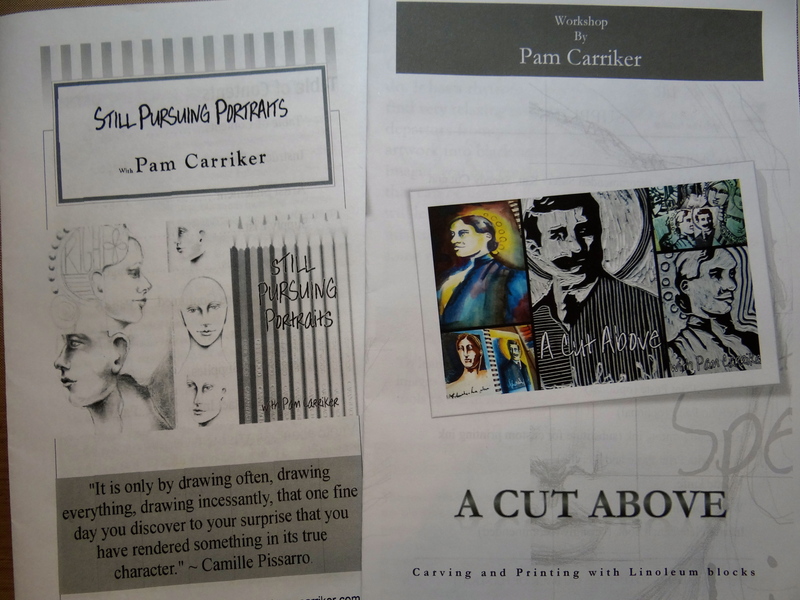 look forward to your “A Cut Above” class as I’ve been dabbling a bit in cutting stamps, but need some focus and direction – and some tips!!! Would also love an opportunity to win! Thanks! Oh how I would love this. I’m sharing for ya! Oh, Pam, what a great giveaway! I took your online class two years ago at Artful Gathering (bought the DVD too, LOL) and LOVED it. I’m Andrea E. and you can contact anytime at the e-mail on this comment. Thanks again, Pam, for your ever so generous spirit! Glad to hear you are so busy, off to “share” you. Hi, Pam: I’d love an opportunity to win one (or more) of your classes!